For many Tokyoites, an evening after work spent in a "neko cafe" (cat cafe) sounds purrfect. The metropolis is home to several dozen of these cafes, which charge patrons by the hour to play with cats. But new regulations threatened to put their paws all over these cafes. For regulars, the cafes offer a place to unwind and play with cats, while they sip coffee. Many urban apartments do not permit pets, meaning that pet lovers are left without furry friends to call their own. The neko cafes fill that void. The original cafe wasn't in Tokyo—it wasn't even in Japan. In the late 1990s, the first cat cafe appeared in Taiwan. It attempted to scratch a niche that many city dwellers might have: lack of animal companionship. By 2004, the first neko cafe opened in Osaka. 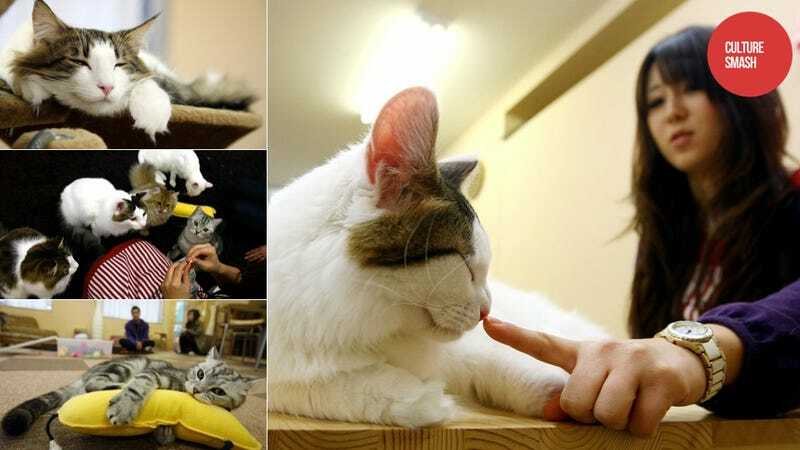 More cat cafes soon opened in Tokyo. "It's a great place, it calms the stresses of working life." Pet lovers often describe the joy their animals give them. Those living in environments that do not permit pets yearn for that interaction. "It's a great place, it calms the stresses of working life," Ayumi Sekigushi, 23, told Reuters about her favorite cat cafe. But some animal rights activists call the establishment inhuman to animals, saying that they are stressful for cats. "From morning to night these cats are being stroked by people they do not know. For the animals, that is a real source of stress," Animal welfare campaigner Chizuko Yamaguchi told Agence France-Presse last month. Many neko cafes, however, tell customers not to disturb cats while they are sleeping and dim the lights at nighttime. As many cat owners can testify to, however, many felines get extra frisky in the evening. All cat cafes must adhere to Japanese law regarding the protection and welfare of animals in order to keep their license and continue to operate. While the cats (and cat cafes) vary, some cat cafes even house only former strays. A new ordinance—a revision to Japan's Animal Protection Law—aimed to prohibit the display of animals after 8pm. "If I close this cafe at 8:00 pm, I'll see red ink," neko cafe owner Shinji Yoshida told AFP. Yoshida's cafe is located in Tokyo's Ikebukuro and 80 percent of his customers are apparently office workers who drop in after work to play with the cats. The ordinance was aimed at pet shops that keep long hours—thereby keeping the animals up late in small cages under bright lights. Even animal rights Japanese activists conceded that the ordinance was not targeting cat cafes, and the government finally decided—after some careful consideration—to allow the neko cafes to remain open until 10pm, which is when most cat cafes close anyway. The revision to Japan's Animal Protection Law goes into effect June 1. And while it now will not impact these cafes, it should serve as an important reminder of what the animals do need: lots of catnaps.